Russia Wins Tank Biathlon; Next Up, Caspian Naval Biathlon? 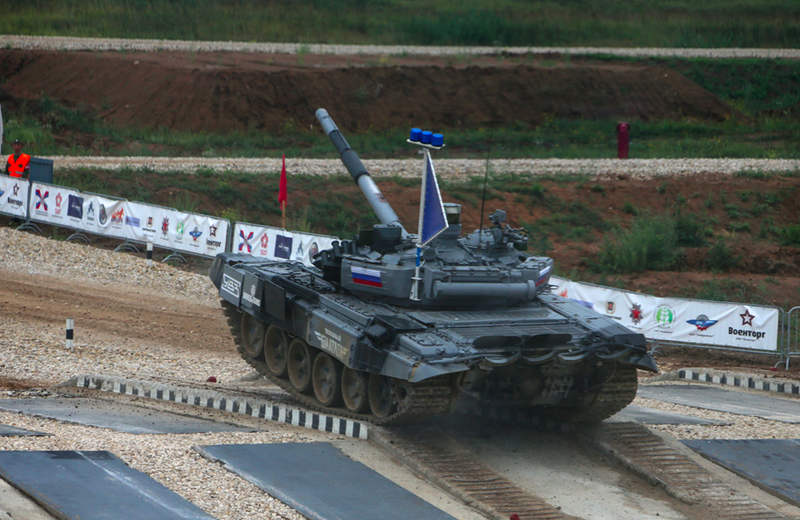 Russia hosted -- and won -- the second international tank biathlon competition, an event Moscow appears to be trying to turn into a major forum for military cooperation with friendly customers/potential weapons customers. While last year's inaugural event featured just three other competitors -- fellow Collective Security Treaty Organization members Armenia, Belarus, and Kazakhstan -- this year saw an additional eight countries taking part: Angola, China, India, Kuwait, Kyrgyzstan, Mongolia, Serbia, and Venezuela. But the real winner is the Russian defense industry. All the teams except China used Russia's own tanks, T-72Bs (China brought their own Type-96a tanks.) This was apparently the source of some controversy, as many of the countries participating don't use the T-72B but the older T-72. But the goal was to show off the newer variants for potential customers, an official with Russia's Military-Industrial Commission told Chinese state television: "Russia is showing some of its newest military devices to some countries planning on enhancing their own military strength. And one major event is the show of Russian-made modernized T-72B3 tanks, that is to say, many clients for Russian-made weapons had an opportunity to test such a tank through this competition." And they could upgrade even further: Armenia's prize for coming in second was a T-90. While the participating countries are mostly geopolitically close to Russia, Moscow says that wasn't by design: they invited over forty countries, including some NATO members, but all NATO members declined, likewise Ukraine. The event was heavily promoted by the Kremlin; state news agency RIA Novosti ran at least 43 stories on it, it was covered by 700 journalists and Russia has created an international Tank Biathlon Federation which will "promote the peaceful development of tank biathlon and promote its popularization." The tank biathlon is reportedly even getting its own anthem. The event, held outside Moscow, also attracted 70,000 spectators over the two weeks of competitions, and it was of course imbued with the patriotic spirit engulfing Russia in the wake of its annexation of Crimea. One of the most popular attractions at the event was "an installation 'Polite Tanks,' the idea of which was peaceful tanks, showing that Russia doesn't aim at aggression and war, but to 'defend its traditions, heritage, its Fatherland.'" And this is apparently just the start: Russia is planning on expanding these sorts of international military competitions, including a naval competition on the Caspian Sea.